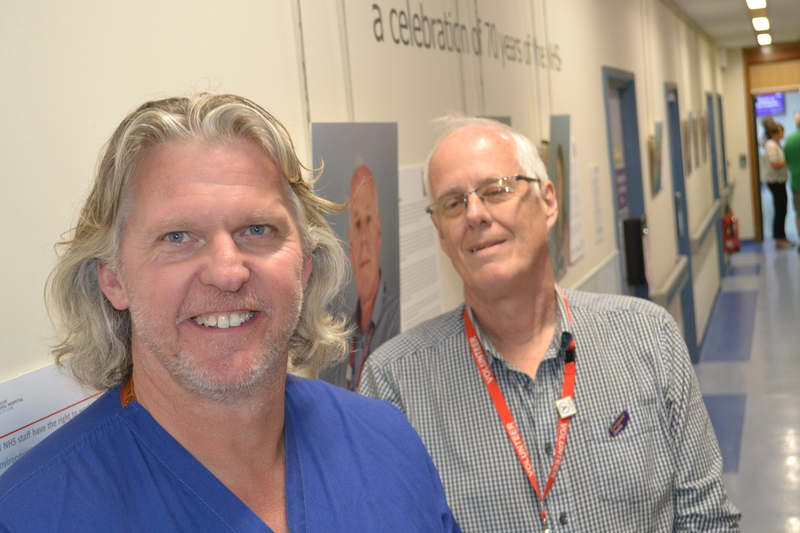 Celebrating the NHS turning 70, Yeovil Hospital is shining a light on the people who make it what it is. Healthy Voices is the latest exhibition to line the walls of the outpatients’ department corridor, telling the stories of volunteers, patients and staff, both past and present. Throughout the next few months, visitors to Yeovil Hospital will see this moving portraiture exhibition by Gabriella Sancisi. The portraits are part of the 70th anniversary celebrations and each image is accompanied by a statement from the sitter describing how he or she is connected to the hospital. There are poignant stories of illness and recovery as well as references to career paths and long-service within the NHS. Bob Norbury is featured in the exhibition. Bob is now a regular volunteer and can often be seen at the main entrance collecting for the Hospital Charity or supporting patients who have suffered a stroke. Bob was interviewed for the Healthy Voices and told his story. Bob said: “I’ve lived here for 30 years and for the first 20 I didn’t even go in the hospital. After I retired, I had a stroke and was sent to Yeovil Hospital. I was in there for six weeks and during that time they treated me very, very well and that’s why I now volunteer at the hospital and do quite a lot of work for the Stroke ward and the charities. The exhibition has been funded by the Heritage Lottery Fund and is part of a wider project collecting voices and memories relating to the NHS over the past 70 years. These recordings will form the beginnings of an oral history archive which will be available via the Community Heritage Access Centre in Yeovil. The portraits will form part of the Hospital’s Art Collection and will be on permanent display providing a visual and written insight into some of the incredible people connected to the Hospital.